He is a co(de)founder at Overleaf, an online editor that helps scientists write papers collaboratively. He did a PhD on how to efficiently operate fleets of driverless cars, so we'll be ready when they get here. That was in the engineering mathematics department at the University of Bristol. He was part of the team that delivered the world's first Personal Rapid Transit system at London's Heathrow Airport in 2011 — computer-guided taxis on dedicated roads. 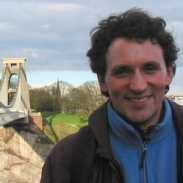 He was a post-doc at the University of Southampton, and then the University of Bristol, where he worked on ways of cheaply tracking cars through road networks to help us understand how people make travel decisions. He studied computing science at the University of Alberta. Box, S., Lees-Miller, J. D., Snowdon, J., Hammond, J., Hamilton, A., Gupta, S., Wilson, R. E., and Waterson, B. 30 cars, figure of 8, 1 show: large scale proving ground experiments to investigate junction control. In 45th Annual Conference of the Universities’ Transport Study Group. 2013a. Box, S., Lees-Miller, J. D., Snowdon, J., Hammond, J., Hamilton, A., Gupta, S., Wilson, R. E., and Waterson, B. Lessons from proving ground experiments to investigate junction control. In 16th International IEEE Conference on Intelligent Transport Systems. 2013b. Lees-Miller, J. D. Method and System for Resolving Deadlocks In a System. Patent GB2457927 filed, 2008.